Where is Sighthound Video 6? Home / Blog / Where is Sighthound Video 6? First, some history about me and Sighthound Video. In 2013 I started Sighthound with a great team, and one of the first things we did was acquire the Vitamin-D product and rename it Sighthound Video. I use Sighthound Video every day. I run five installations at homes and offices with over 60 cameras. I love it... except for the user interface, which has become dated and needs an update. More on that later. I'd like to talk about the status of each. Sighthound Video has improved significantly since its origins as Vitamin-D. We added a web interface, iOS and Android apps, the grid view, IFTTT integration, audio support, ONVIF support, support for high-megapixel cameras, made the computer vision more accurate, increased performance, and added more cameras and fixed more bugs than I can readily count. We also didn't do enough. Especially over the last year. but it's taken us far longer than we planned, because . . .
All of our products use computer vision - trained computer software that can detect, follow, and recognize people and things in an image. We started Sighthound after starting and selling Voxeo - an outstanding (ok, I'm biased) platform for creating telephone/voice applications including speech recognition. At Sighthound the mission has been to do the same with computer vision, and to have Sighthound Video be our flagship application on our computer vision platform. We were able to build an acceptable platform for computer vision quickly. It took way longer than we expected to make it phenomenal. We spent almost all of 2018 working on the gap between "acceptable" and "phenomenal". I believe we've closed the gap. Our platform is called Sighthound.io. You can read more about it at sighthound.com/products/sighthound-io. YAML-based specifications we call DFML. After finishing Sighthound Video 5, the plan was to build Sighthound Video 6 with Sighthound.io, replacing our older computer vision technology that's used inside Sighthound Video today. First, we had a year-long delay because Sighthound.io wasn't ready. Now it is. In retrospect, we should have ditched our plan to make Sighthound Video 6 use Sighthound.io and moved forward with other improvements instead. For example, rebuilding our user experience (UX, which includes the user interface) across desktop, web, and mobile applications. We know we can do better. We've purchased the top-10 available consumer video cameras (Nest, Ring, Swann, Arlo, Lorex, ADT, Wyze, D-Link, Tend, and Xiaomi), looked at how they work, and have designed a new UI using the best of what we saw - and creates some new things we think are even better. We'll deliver this new UI in Sighthound Video 7 or 8. We have a memory "leak" that causes Sighthound Video 6 to use slightly more RAM every day that it is running. We have poor "night vision". What do I mean by this? While we can track, detect, and recognize more kinds of objects better and faster in well-lit conditions, our ability to do the same in the dark or at night has decreased. We know why this is. 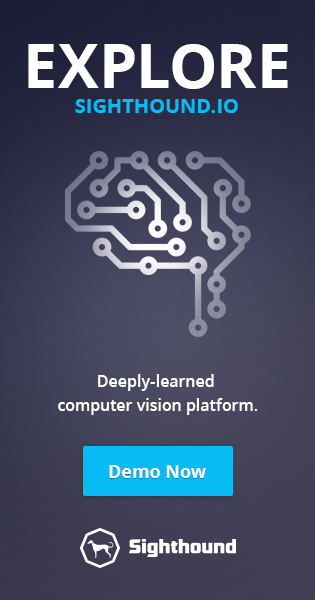 Sighthound.io is built on Deep Neural Networks - a technique, inspired by the brain, that enables our Sighthound.io to learn by observing and training on (lots and lots of) data. Our "night vision challenge" is simple - over the last five years we have massively increased the amount of data (images and video) we have from cameras that are in well-lit conditions, but have gathered far less data from poorly-lit cameras, low-light cameras, and especially infrared-lit (or IR) cameras. Redactor is a video editing tool, like Adobe Premier or Final Cut Pro, that makes it extremely easy to load a video file and find the people, faces, vehicles, and license plates in it. Users can then select which of those things they want to "remove" or redact by blurring, pixelating, or covering them. You've probably seen videos that have been redacted on the news. Redactor is a wildly successful product. Odds are 50/50 that when you see redacted video it's been redacted with our software. Redactor customers have provided us with figurative tons of data from well-lit cameras, and we've trained our software extensively on this data. So, in short, our deep-neural-training workout gave us strong arms (day-vision) and weak legs (night-vision). It's time to do more leg days. We need to make Sighthound Video better, but I feel support is where we fell shortest. Our support for Sighthound Video, to be honest, has also been "acceptable" and not "phenomenal". We are changing that. While I started Sighthound with the team in 2013, I just became the CEO of Sighthound two months ago. I have a very particular set of skills... and one of them is building world-renowned support organizations. At our prior company, Voxeo, we had the highest Net Promoter Score (NPS, a measure of customer satisfaction) that had ever been achieved by any software or telecommunications company. We will achieve the same at Sighthound. It will take time, over the next year, to do so. Anyone who purchased Sighthound Video in 2018 or paid for yearly support in 2018 will receive a free upgrade to Sighthound Video 6 when it is released in a few months. In April we will start an open BETA of Sighthound Video 6. We will be providing open BETA releases for all Sighthound Video upgrades from now on. Sighthound Video already has a built-in mechanism to report generic problems. Starting with this BETA, we will also have a built-in ability to specifically report when we failed to identify objects in a video. That report will have an option to send video associated with that failure to us. This will help, among other things, improve our "night vision" before the final release of Sighthound 6. We are gathering as much low-light / IR-light video as we can to train on. I built out 144 terabytes of storage for my personal Sighthound Video installs starting in 2013, and have saved 24 hour a day / 365 day a year video from all of my cameras since then. All that data is going into training. We have other employees who are doing the same. We are also obtaining as much low/IR-light video as we can to train on. Do you have some you are willing to contribute? Please let us know. The more data, the better the training. After Sighthound Video 6, Sighthound Video 7 will ship as open beta later this year. It will focus on making the product faster, more accurate, and much easier to use. We are upgrading our support software. We currently use JIRA and Fogbugz for support software. These are systems that were primarily built for engineers, not for customers. We are evaluating the top customer-centric support platforms on the market, and will be deploying one of them (we're down to two choices) this summer ... or sooner. We are doubling our Sighthound Video support staff and increasing our support hours. I can't make any promises yet, but you will likely soon be seeing more support responses on weekends and evenings. We are re-evaluating our support forum. I love forums, but we need to have better two-way communication with our customers. Forums may or may not be the best way to do this. We haven't decided what to do yet, but we will be asking many questions about what we might do. I hope this explains some of what's happened - and what will happen - with Sighthound Video. I am deeply committed to improving this product and our support of it, and I apologize that we've been so far behind our commitments to Sighthound Video over the last 18 months.